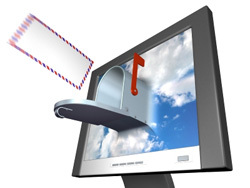 An electronic newsletter can be a wonderful tool for your business -- if produced properly. Unfortunately, all too often, electronic newsletters are sent straight to the 'junk' mail box because they are poorly written, designed, and are waaay too long. Email providers, IT departments, and spam filter providers are becoming more aggressive than ever with regard to spam. At any given moment, between 80 and 90 percent of all email sent around the internet is spam. Because of this, almost any kind of email newsletter can generate a “false positive” reading inside a spam filter. This would cause it to be automatically removed from the recipient’s inbox. Examples of emails that can generate “false positive” readings in spam filters would include account reminder notices, organization newsletters, package delivery receipt email notifications, PayPal notifications, and so forth. The following tips should help to increase the usability, and thus the effectiveness, of your electronic newsletter. Remember, people receive a great deal of electronic mail---most of it poorly written---and they have very little patience when going through their inbox. Do not send out random mailings. Use a regular delivery schedule and be consistent. It will make your newsletter more reliable and by sticking to a schedule, your subscribers will begin to anticipate your messages and will feel that signing up for your newsletter will be less intimidating because they know what to expect. They will know in advance how much e-mail they will receive after they provide their address to you. A good rule of thumb would once per month, always on the same day. Email Providers are becoming more strict and look for words like that in your newsletters. If it takes more than 30 seconds to subscribe to a newsletter, most people won't bother. It should be drop-dead easy for your customers and/or web site visitors to sign up for your newsletter. Place the sign-up box right on the home page of your web site. About unsubscribing: Make sure you always place a clear link at the bottom of each newsletter with unsubscribe information. Unsubscribing should be a 1-click process. If you want to use a lot of graphics and/or really 'wow' your recipient with your newsletter, then hire a professional web developer to assist. Creating proper graphics for a newsletter is much different (and more challenging) than for a web page. If you screw up a web page, it's only one page. If you screw up a newsletter, too late---because it's already gone out to thousands of people and you can't quickly re-edit it. People scan content; they don't read word-for-word. Make sure you have a clear and understandable headline. Use font like Arial for the headlines and Verdana for the body text. That's how this very page was designed and it's easy to read and scan.